SNAX ALERT: Wendy's Jalapeño Fresco Spicy Chicken Sandwich and Ghost Pepper Fries Are BACK! Wendy's is tickling our tastebuds AGAIN with the return of their Jalapeño Fresco Spicy Chicken Sandwich and Ghost Pepper Fries! We loved these feisty treats the first time around and we're doing leg kicks now that they're back! For more info, check out Wendy's official press release below! April 13, 2016 (DUBLIN, Ohio) – Attention all heat seekers. This is not a drill! Wendy’s® is igniting customers’ passion for spice with the release of the Jalapeño Fresco Spicy Chicken Sandwich and Ghost Pepper Fries. Made especially for those with fire-proof palettes, the sandwich and fries were almost too spicy to make it onto the Wendy’s menu. Spicy lovers will appreciate the 10 different sources of heat in the Jalapeño Fresco Spicy Chicken Sandwich, which include red pepper, chili pepper, jalapeño, paprika, black pepper, cayenne, capsicum, habanero, red jalapeño and ghost pepper – one of the hottest chili peppers in the world. The Jalapeño Fresco Spicy Chicken Sandwich features Wendy’s Spicy Chicken with its signature blend of spice and 100 percent all-white meat chicken breast, topped with fresh, diced jalapeños – seeds and all – and specially made ghost pepper sauce, and capped with a bakery-style, freshly toasted red jalapeño bun. The heat is complemented with savory flavors from warm, melty cheese sauce, delicious Colby Pepper Jack cheese and crunchy red onion. The Ghost Pepper Fries are covered with a cheese sauce, diced, fresh jalapeños, shredded cheddar cheese and a ghost pepper sauce. 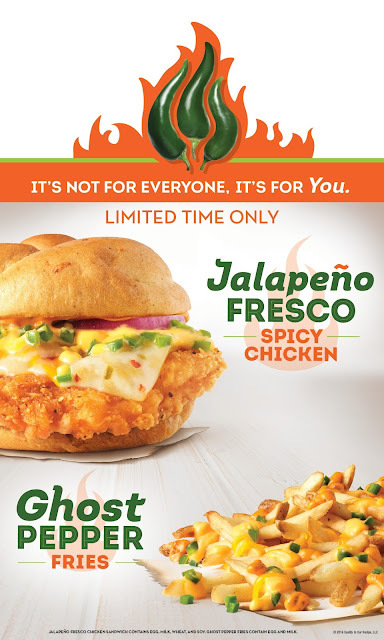 The release of Wendy’s Jalapeño Fresco Spicy Chicken Sandwich and Ghost Pepper Fries is supported by an integrated marketing campaign that highlights how the items bring a heat and spice that is only for true heat seekers. 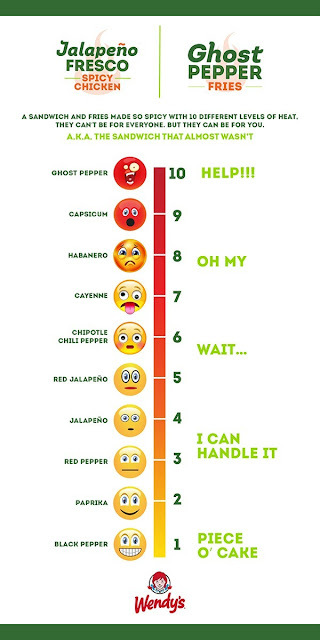 Digital campaign spots feature humorous reactions to tasting the unmatched spiciness of Wendy’s Jalapeño Fresco Spicy Chicken Sandwich and the TV advertising focuses on Wendy's release of the sandwich, despite the recommendations of naysayers in focus group testing. The creative highlights the fact that the deliciously different spice brought by the Jalapeño Fresco Spicy Chicken Sandwich and Ghost Pepper Fries is meant for the “yaysayers” – those who can truly handle the heat. Available for a limited time only at participating Wendy’s, the Jalapeño Fresco Spicy Chicken Sandwich has a suggested price of $4.99. The Ghost Pepper Fries have a recommended price of $1.99. Prices and participation may vary.